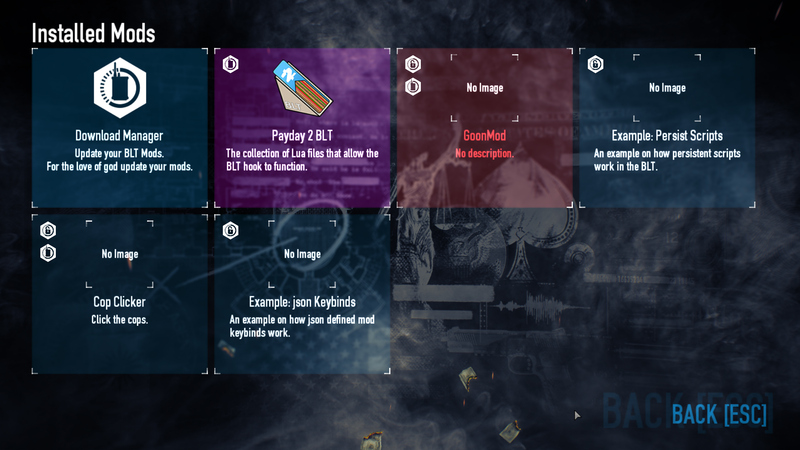 The BLT has been updated to support LuaJIT in Payday 2, and the BLT has changed massively thanks to a huge update. The in-game mod loader has been completely rewritten from scratch so that it is easier to use for users to understand, and easier for developers to get started with. This means your mods might be broken until the mod developer updates them. Get the updated BLT from the Download page. The mod manager has completely changed so that you can more easily view all of your mods and configure them quickly. Any mods not supported by the new version of the BLT will be highlighted red so you can find and remove them easily. Mods now have their own info page accessible from the mod manager so that you can easily turn your mods on or off, and set or check for updates to them. Developers can also view debug information on their mods to see what is being loaded and processed. The new Download Manager will list all of your mods with available updates so that you can easily install them with a single button press. 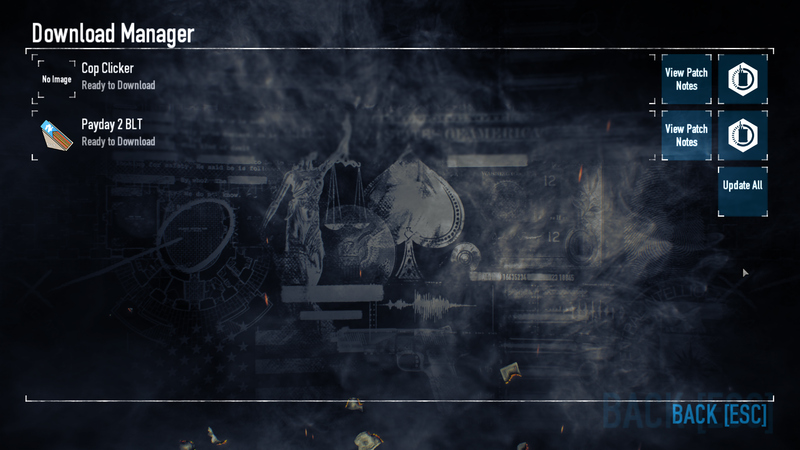 Large mods and slow download speeds are now supported by the BLT, instead of disconnecting half way through your downloads. Mods will also be validated when they are downloaded before replacing your old mods, just in case they get corrupted while downloading. 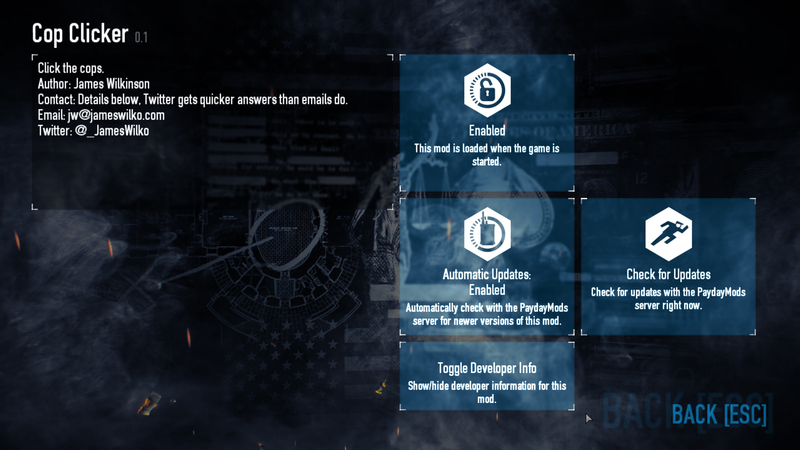 The notifications on the main menu have had a bit of a redesign to fit into the main menu better, and will handily provide you with a little info bubble to let you know when your mods need updating. The options menu has been cleaned up a bit to make sure that BLT-related menus are kept together and are easy to find. The mod loader API has been completely rewritten to make it as stable as possible for the future. This means your mods might be broken until you update them. Check the updated BLT code if you made direct calls to the BLT in the past, as well as if using the LocalizationManager or NotificationsManager, as these have also undergone complete rewrites. The console has received a slight visual update to make debugging easier if you have it enabled. Information from the BLT Injector will be displayed in blue, errors will be displayed in red, and Lua prints will be displayed in white. Your logs folder will also be cleaned out automatically by the BLT, keeping only the most recent days logs.